Some 40 years ago, the steel industry embarked on intensive research and development that produced a controlled rolling process that, combined with micro-alloying, resulted in major breakthroughs in steel properties. Steels with small amounts of aluminum, niobium, vanadium or titanium rolled at 880 C rather than the conventional 1050 C resulted in high-strength low-alloy (HSLA) steels with tensile strengths in the 350- to 650-MPa range, combined with good toughness. Next came development of a process called CalSil treatment, by which the addition of silicon and calcium to steels reduced sulphur content, bringing improved formability both along and across the direction of rolling. The next major breakthrough in steelmaking came in the mid-’90s when steel suppliers further refined thermalmechanical processing, built new equipment such as continuous-annealing lines, and began producing today’s advanced high-strength steels (AHSS), with tensile strengths in the range of 440 to 980, with some steels now offering 1400-MPa tensile strength. Within the next few years, industry analysts predict that as much as half of the steels in automobiles will be AHSS. As AHSS products have begun to make a strong presence in the market, the amount of information on them—their characteristics and properties, and tips for forming and fabricating them—also has increased. For example, the International Iron and Steel Institute now offers a publication titled Advanced High Strength Steel Application Guidelines, available on its website, http://www.worldautosteel.org/. The publication, updated in September 2006, is a must reference for any company working with AHSS. It describes the different types of AHSS—dual-phase (DP), transformation-induced plasticity (TRIP), complex-phase (CP), martensitic (MS), ferrite-bainitic (FB), twinning-induced plasticity (TWIP), hot formed (HF) and post-formed heattreatable (PFHT). Also a must for your library is the new Surface Vehicle Recommended Practice SAE J2745 document (see the sidebar to this article, page 32) issued in July 2007 that categorizes and provides the properties of AHSS automotive sheet steels. The recommended practice covers 13 cold-rolled AHSS types (six DP alloys, three TRIP steels and four MS steels) and seven more hot-rolled sheet steels. We contacted several of the world’s steelmakers (in cooperation with the International Iron and Steel Institute, www.worldautosteel.org) to find out what AHSS steels they have recently developed and made available to the market. What follows are brief descriptions; additional information can be found on each company’s website. Dual-phase steels such as the Dual-Ten family from U.S. Steel, illustrated here, exhibit superior initial strain-hardening behavior when compared to high-strength low-alloy (HSLA) steels. Swedish steelmaker SSAB offers a full lineup of dual-phase AHSS types under its Docol brand name. Its six Docol DP steels available for the U.S. market have minimum tensile strength to 145 ksi (1000 MPa). These cold-rolled dual-phase steels find global automotive applications in door beams, bumper reinforcements and seat tracks. SSAB offers the steels in sheet thicknesses of 0.5 to 2.0 mm in widths from 800 to 1500 mm, depending on steel grade and thickness. As with other DP steels, Docol DP types offer good formability, and at more extreme levels of forming SSAB recommends forming in the direction transverse to the rolling direction rather than in the longitudinal direction. Also, when shearing or punching Docol DP, cutting clearance is of primary concern, says SSAB. 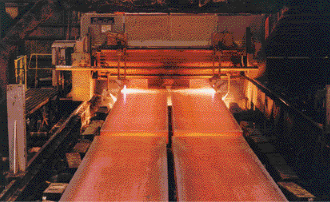 It recommends a cutting clearance of 10 to 12 percent of sheet thickness for Docol DP steels. SSAB also recently introduced AHSS types for rollformers: Docol Roll, a pair of cold-reduced high-strength steels that SSAB claims represent the world’s first AHSS alloys developed specifically for rollforming. Their primary beneficial mechanical property: a high ratio of yield strength to tensile strength, which means that stresses in highly formed areas of a rollformed part are comparable to the stresses in less-formed regions. Small differences in residual stresses over the entire part cross-section reduce the tendency for bending and twisting, resulting in dimensionally stable and flat profiles. Another bonus with these steels, according to SSAB, is their high level of internal cleanliness—a minimal amount of slag inclusions in the steel allow the rollforming of very tight radii. Docol Roll 800 (800-MPa minimum tensile strength and 600-MPa minimum yield strength) has a minimum bending radius (for press forming) of 0.9 times sheet thickness; Docol Roll 1000 (1000-MPa minimum tensile strength and 850-MPa minimum yield strength) has a minimum bending radius (for press forming) of 1.5 times sheet thickness. SSAB stresses that these minimum bending radii are valid for bending processes and that in well-designed rollforming lines fabricators might achieve much smaller radii. U.S. Steel Corp., stressing that it develops new steels in partnership with its automotive-industry customers, has had its AHSS grades in production vehicles since 1999. It offers hot-rolled dual-phase steels under the brand name Dual-Ten, with products available as hot-dip galvanized (HDG Dual-Ten) and hot-dip galvannealed (HDGA Dual-Ten). Nucor entered the AHSS arena in 2006 with the introduction of DP 590—hot- and cold-rolled, galvanized and galvannealed products (the firm does not produce an uncoated cold-rolled dual-phase steel). Nucor’s Dual Phase 590 is produced at its CSP (compact strip production) facility in Berkeley, SC, in hot-rolled form from 2.5 to 6.5 mm thick, and cold-rolled hot-dip galvanized or galvannealed sheet from 0.8 to 2.0 mm thick. Compared to other DP590 grades available, Nucor officials claim that its process yields improved mechanical properties—elongation, formability, impact toughness and weldability to name a few. For example, its hot-rolled DP 590 offers an impact energy of 100 ft.-lb., reportedly more than twice that of other DP 590 steels the company has tested. Dual Phase 590 has a tensile strength of 620 MPa, yield strength of 380 MPa, total elongation of 25 percent and an n-value of 0.168. Building on its success with Dual Phase 590, Nucor recently launched Dual Phase 780 (780 MPa minimum tensile strength), also available hot- or cold-rolled, galvanized or galvannealed. Although the company can only produce hot-rolled dual-phase steels down to 2.5 mm thick, it’s pursuing continuous improvement at its mills so that it will soon be able to produce lighter-gauge hot-rolled products. And, later this year Nucor will commission a new galvanizing line at its facility in Decatur, AL, to increase production capacity for galvanized and galvannealed Dual Phase 590 and 780 in a variety of gauges and widths. 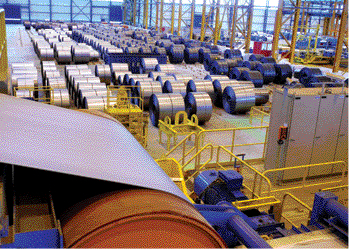 This ArcelorMittal cold-rolling mill in Brazil reduces the thickness of flat steel products by rolling at room temperature. When Arcelor and Mittal merged several months ago, the company quickly formed its Automotive Worldwide Business Unit, marrying the firm’s two research and development groups. The new unit, stocked with more than 400 engineers and technicians devoted to automotive-related R & D projects, aims to develop breakthrough steel products with quick speed to market, in addition to offer technical support. New from ArcelorMittal Automotive is the press-hardened boron steel Usibor 1500 (maximum 0.25 C, 0.35 Si, 1.4 Mn, 0.30 Cr and 0.005o B. Similar to SSAB’s Docol Boron 2/Domex 024 B and Boron 04/Domex 044 B, Usibor 1500 offers a tensile strength to 1500 MPA. The firm recommends Usibor 1500 as a replacement for many automotive components currently formed of dual-phase steels, including front- and rear-end rail extensions, A-, B- and hinge pillars and B-pillar reinforcements, and door and bumper beams. It’s offered cold- or hot-rolled, and joins the firm’s long list of AHSS steels, including multiphase alloys (ferrite plus bainite plus pearlite, with maximum 0.15 C) to 1200-MPa tensile strength, dual-phase steels, and TRIP steels to 980 MPa. In fact, just entering the testing phase late in 2007 was the firm’s newest TRIP steel, TRIP-Dual 1200, an advanced ultra-high-strength bainitic steel. Japan’s JFE Steel Corp. has offered dual-phase cold-rolled advanced-high-strength sheet steels in the 780 to 1470-MPa tensile-strength range for several years, offering good press formability, spot weldability and stable mechanical properties, to improve vehicle crashworthiness and fuel efficiency. In 2004 the firm introduced a type with 980-MPa tensile strength, in three variations, that reportedly offers improved elongation and stretch-flange formability, due to better control of microscopic-crack propagation during forming. JFE manufactures AHSS steels using its continuous annealing process with water quenching (it refers to the process as CAL-WQ). The steels, particularly the 980 type, have found wide acceptance in seat-frame parts, to allow designers of seat structures to use the seat itself to support impact during collisions. Low yield ratio—a high-ductility DP steel for stretch-formed parts that features a low yield point, high elongation and low hole-expanding ratio, recommended for body-in-white structural components such as pillars. High hole-expanding ratio (HER)—this DP steel combines elongation and stretch-flange formability and has a medium yield point, medium elongation and medium HER, recommended for bumper reinforcements, seat frames and seat rails. Salzgitter, Germany, is home to Salzgitter Flachstahl, the largest steel subsidiary in the Salzgitter Group. In 2006, the plant’s 4500 employees produced some 4.6 million tons of steel. The mill works closely with the firm’s technical customer-support partner, Salzgitter Mannesmann Forschung, to develop target-oriented solutions for product and process optimization in cooperation with users and customers. This close cooperation, according to company officials, yields customer-oriented and application-related product development. An example of this comes with Salzgitter’s recent release of two new air-hardening cold-strip steels—LH800 and LH900. While dual-phase steels have their final mechanical properties already in the as-delivered state, with little change from processing, air-hardening steels are delivered to the metalformer in a soft state with excellent formability, according to Salzgitter. While AH steels have been around for some time available only as long products such as bar and wire, due to high carbon content (1 percent or so), the new breed of AH steels now have low carbon content and a low carbon equivalent, allowing manufacturers to offer them in sheet products with good formability and weldability. They then attain final high-strength values during forming and subsequent processing. This gives stampers the ability to combine good forming (deep-draw) properties with high strength in the final component. This tunnel is stamped from Salzgitter’s HCT600XD+Z alloy, a continuously hot-dipped dual-phase steel. Material datasheets released on LH800 and LH900 in November 2006 describe the steels as having outstanding forming capabilities, and finished components having high strength and crash properties. Tensile strength of the steels is at least 800 or 900 MPa (116 to 130 ksi). and cross members. Stampers can use existing tooling, says Salzgitter, with only minimal modifications. One caveat to using these materials: They cannot be delivered in galvanized form, since the zinc coating would be compromised during heattreating. Rather, parts must be batch-galvanized after treatment. In addition to its new PFHT steels, Salzgitter recently introduced press-hardening (PH) steel 22MnB5, a boron-alloyed tempered steel that can achieve tensile strengths to 1300 to 1800 MPa (190 to 260 ksi) after hot forming with controlled in-die quenching (press hardening). These steels also get notoriety for their high yield strength, based on manganese (1.2 to 1.4 weight percent) and boron (0.0020 to 0.0035 weight percent) content. Also recommended for A- and B-pillars, frame components and cross members, 22MnB5 also would prove ideal for penetration protection—sills, bumpers and bumper mounts, and roof frames. Boron-alloyed tempered steels such as 22MnB5 can be formed in one or two steps, depending on the complexity of the component. As-delivered, stampers can cold-form the sheet, offered by Salzgitter in thicknesses from 1 to 3 mm and in widths from 900 to 1500 mm, and then harden in a separate process. Or, as an added step, stampers can hot-form the previously cold-formed parts, with subsequent press hardening in the die. This requires water cooling in the press, and a coating on the steel sheet to avoid oxidation and scaling of the sheet. Learn all about the properties of AHSS and the techniques used to form and fabricate them at this PMA-sponsored seminar May 22 in Cleveland, OH. Seminar topics include stretchability and bendability, springback, punch and blankholder loads, tool temperature and wear, press loads and energy requirements, blanking damage and case studies. For more information, please contact Michelle Underwood: https://www.metalformingmagazine.com/munderwood@pma.org, 216/901-8800 ext. 163.
at a Magna facility where center pillars were deep-drawn from 1.8-mm-thick LH900 sheet. 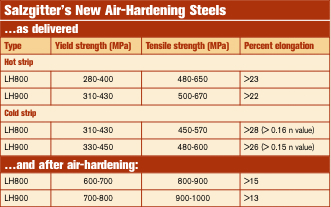 Yield strength of the steel averaged 400 MPa after forming, 700 MPa after hardening and 750 MPa after tempering. Tensile strength averaged 550 MPa after forming, 1000 MPa after hardening and 950 MPa after tempering. Surface Vehicle Recommended Practice, document SAE J2745, issued last July, categorizes and provides mechanical properties of advanced high-strength automotive sheet steels. It incorporates dual-phase, martensitic types and TRIP steels. Anyone forming advanced high-strength steels should consider ordering a copy of this new SAE specification. In addition to yield and tensile strengths, it also specifies total elongation and n-values (where applicable). To order, log on to http://www.sae.org/, or e-mail https://www.metalformingmagazine.com/customerservice@sae.org. See also: ArcelorMittal Steel USA, Inc., Nucor Buildings Group, Ssab Hardox Corp., U.S. Steel Corp.